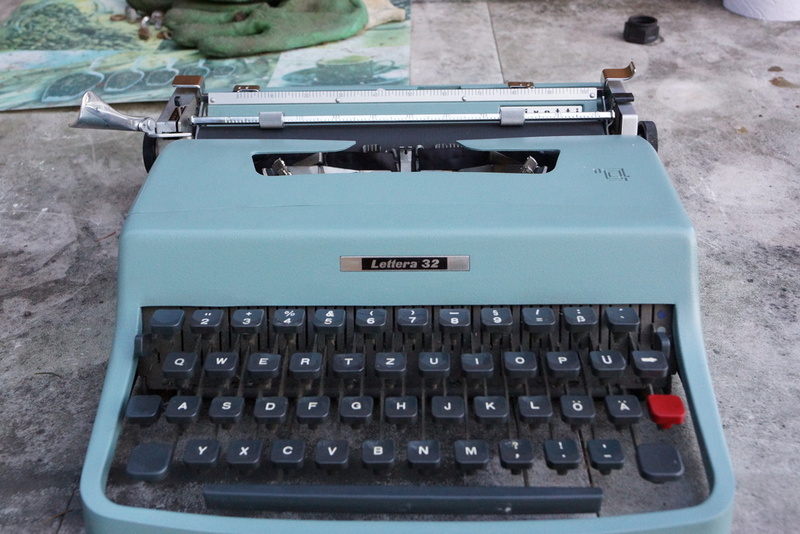 Also picked up a Lettera 22 for $20 the same week I got the two Royals. Jan of 2018, so, that is what will have to do. My most recent purchase is a 1960 Olympia SM4. As I am typing this on my lunch break at school, I have not got the machine handy to check the serial number. It seems to be a great machine, although I think that even though $100 seemed to be a bit too much for a machine, I figured that it was worth it for an SM in the condition that it was in. Haven't posted here in a little while, but my most recent purchase is a late 60s or early 70s Hermes Baby with a French keyboard. I like the design of it visually but find typing on it a chore, it's very stiff (even after cleaning) and doesn't leave a consistent imprint. I am also not a fan of the carriage shift compared to the basket shift on my Smith Corona Galaxie XII. Hopefully I can get my Olympia on working order to have a second machine that has a smoother typing action than this Hermes. Recently I picked up one of those rolling typewriter tray tables off Craigslist. The listing came with a Royal HH standard that is in overall good physical condition with a working carriage and tabs. The only issue is that the left hand margin doesn't work. It has (I believe) a Pica sized typeface. Overall I think I would like it more if I didn't already have my Smith Corona and soon (after I get it back from the repair shop) my Olympia SM8. I just got a Hermes Baby myself, locally. The Craigslist description indicated a German keyboard; the picture looked more like it was a Swiss QWERTZ keyboard (French/German). Either would have been interesting. Turns out it's a Czech keyboard, with all those neat letters with diacritical marks. Unfortunately, they take up keyboard space, so there are compromises: No parentheses; no apostrophe; no semicolon. Also, no Q (though q is there; it's paired with the "section" character). The parentheses is a loss; the semicolon can be worked around easily enough (type a colon then backspace and type a comma). One of the diacritical marks has what looks like an accent; it's on a dead key along with a circumflex. So I can approximate the apostrophe, though it looks odd. I guess I can add a line to an O to get the Q, or just avoid words that begin with Q.
I like the feel of this machine. There are a few sticky keys but they are loosening up, and the typing feel is crisp. The platen is in nice shape. It's a 1943-44, and in pretty good condition overall. I had to do some forming of the line spacing lever, and also the rest on which the shift lock perches, since it caused the capitals to print too high. The H is missing from the screened Hermes on the top of the machine, but it's pretty clean otherwise. The cover could stand the Scrubbing Bubbles treatment. Seems to work in all respects; even the ribbon (on the proper spools!) has plenty of life in it. The seller told me it was her uncle's; he brought it home from Europe after WW II. Maybe he got a deal on it because of the unusual keyboard. All in all, $10 well spent, and I got a Christian pamphlet from the seller too. Incoming - My first Smith Corona - a Clipper. My three most recent purchases: A 1968 Wizard Truetype and a 1957 Remington Quiet-Writer from the estate of an old friend. The Wizard was his wife's and doesn't work at the moment (I hope it's just dirty) and will likely be re-homed, the Remington appears fully functional and was George's so it's a keeper. 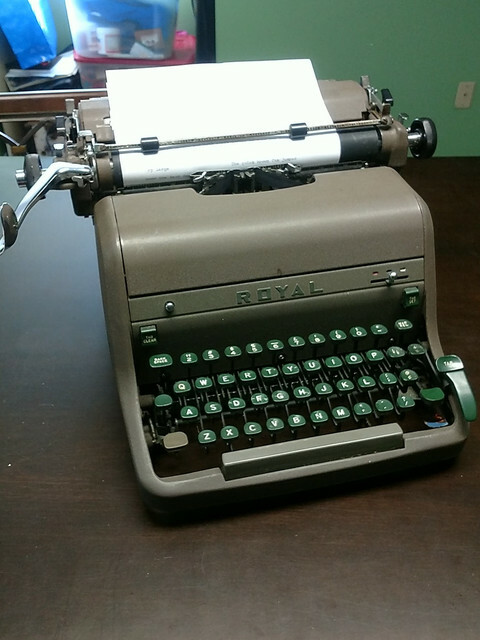 The other buy is definitely a keeper; a 1966 Olympia SM9 cursive and fully functional. The oddball thing about the SM9 is it does not have a red ribbon position on the selector.